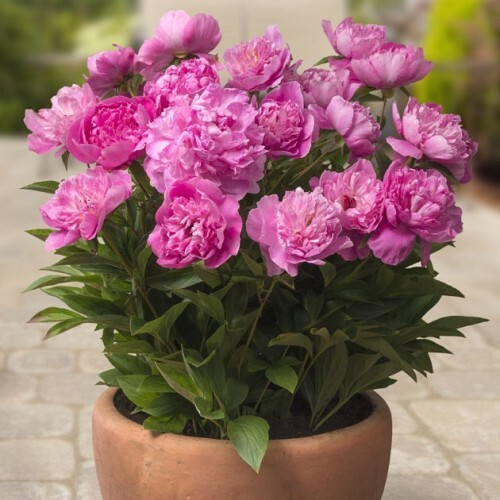 Bred specifically for containers and for those who love peonies but don't have the room. 'Rome' can easily be grown in containers and placed on decks, balconies or protected patio spaces. This herbaceous (soft stemmed) peony cultivar is a shrubby plant that each year will typically by mid-spring, bloom, display attractive foliage throughout the summer and early fall, and then die to the ground after frost. The fine foliage is attractive in its own right, the flowers are very showy, coming in three types: single or semi-double, Japanese, with one row of petals and a large center, and highly ruffled double forms. The colours generally range from white, light pink to magenta and red. It is best to leave them undisturbed, dividing them infrequently. Peonies are one of the longest living herbaceous perennials often found in older gardens, for once established they will survive neglect. One hundred year old peonies are not uncommon. Peonies are considered to be relatively pest free and ants on peony buds are common and totally harmless. If plants do not flower, possible causes include (1) planted too deep or too shallow, (2) too much shade, (3) late frost killed buds or (4) plant is too young or has been recently moved or disturbed.